Yongel is a heavy machinery operator. 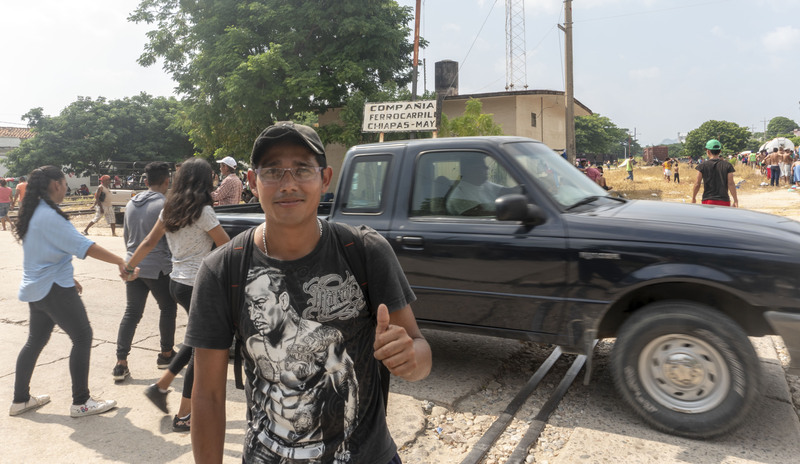 He said he’s from San Pedro Sula, “the industrial capital of Honduras.” He spoke about the extortion he faces and a lack of job opportunities. Yongel: There are three important points that made me make this decision. One is the lack of work. Another is the insecurity in the country. And the third is that you can’t live there because of the crime, because of the extortions. With threats. ‘We’re going to kill someone in your family,’ ‘we’re going to do this if you don’t do that…’ And they ask for a certain amount of money. The last time they did this to me by phone, they asked for L5,000 [$200]. They threatened to kill my mother. They haven’t done it, but you live with that fear. That it could happen someday. So, plus, the government also because it doesn’t support you. So that’s why my compatriots and I have been forced to leave the country, to look for new opportunities, new jobs. And maybe give a better future to our kids. No, I wasn’t working. The company I was working for closed because of a debt that they hadn’t paid. The company decided to close and leave us without work. And if you have kids, a family, it’s different. Because if you’re on your own, if you don’t work, it’s OK. But if you have a family, your kids ask for food, if they’re on the bottle you have to give them their milk. And you have to have money to do so. And for this you have to have work. Without work, you have nothing. Nolveya Romero, from Olancho, Honduras, described a personal experience with land conflict. 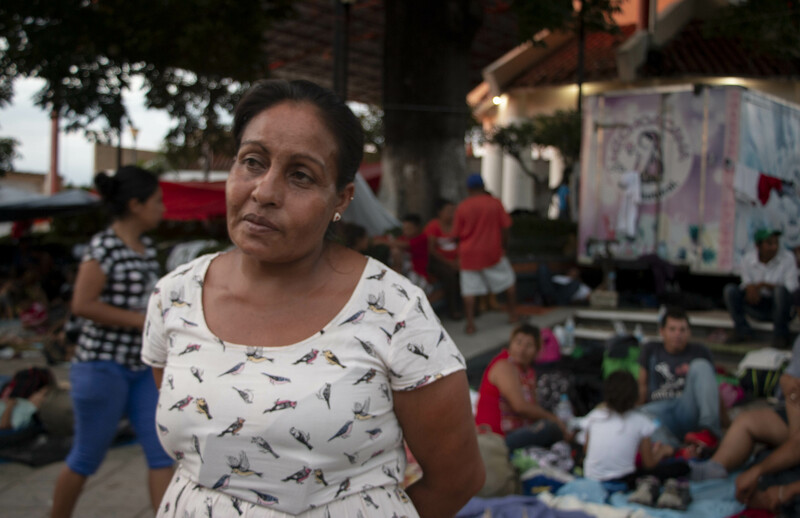 Such conflict is widespread in eastern Honduras where many families lack formal titles for their land and large land owners are increasingly resorting to violence to effect land grabs. Nolveya: Because they threatened me… they killed two of my nephews. They’ve been dead for three months. One they opened here [she drags her finger eight inches down the front of her stomach], the other they opened here [she makes the same motion on her flank]. For rivalries over land. When you work but there are people who want to take your land from you, problems come and they stay. Now my family moved to another hill. And four of us decided to leave. Three are already in the US, thank God. [They wanted our land] to harvest colored lumber. The threats just arrive. They arrive anonymously. They just leave envelopes. The envelopes come below the door. I brought one but I left it in Guatemala, a lawyer there has it. Salvador, 27 years old, managed to get through engineering school. And yet, he was in Arriaga after two weeks of travel with the caravan. He spoke about selling candy on the street to get through school and the coup that ousted President Mel Zelaya in 2009. Salvador: Maybe all of us have the same desire to be someone in life. But the problem we have is that the [expletive] governments we have don’t let us. Look, I’m an engineer. How many times have I had an honest job? To at least be able to say I have an honest job to earn a living. Instead, I always had… to finish my studies I had to be selling candy in the streets to earn just a little from the rich. And look at me now. I’m in Arriaga, Mexico. Suffering. I’m sick. Because the food they’re giving out is just bread. Understand? That makes people sick. Do you know why the coup happened in Honduras? Because Mel Zelaya, what he was doing was creating jobs, helping the poor. And what did the [rest of] the government do, since they didn’t like what Mel Zelaya was doing well, everything he had proposed, what they did was push him out. When Micheletti came, there was a coup and they pushed him out. They threw him out. 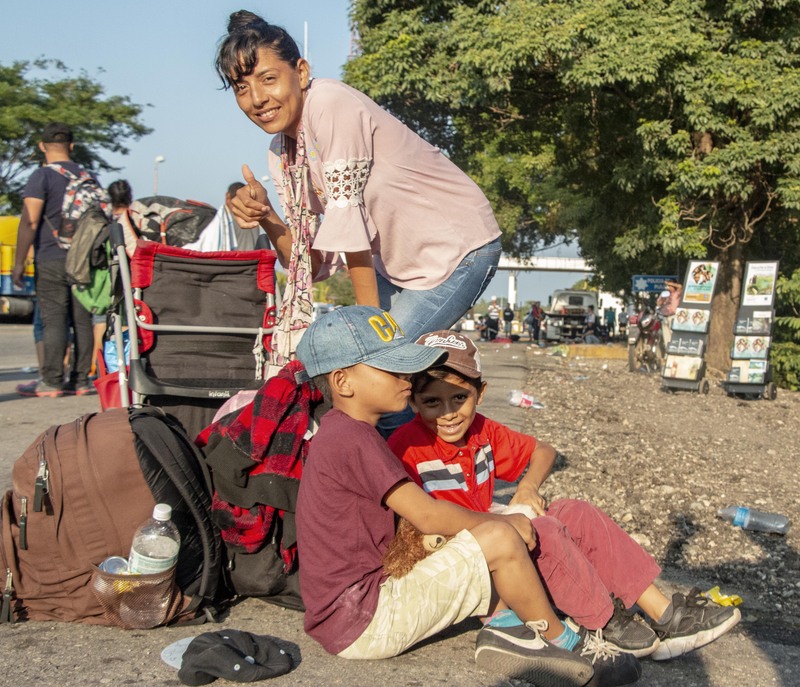 Yani, an elementary school teacher from Colón, Honduras is traveling with her husband and children. 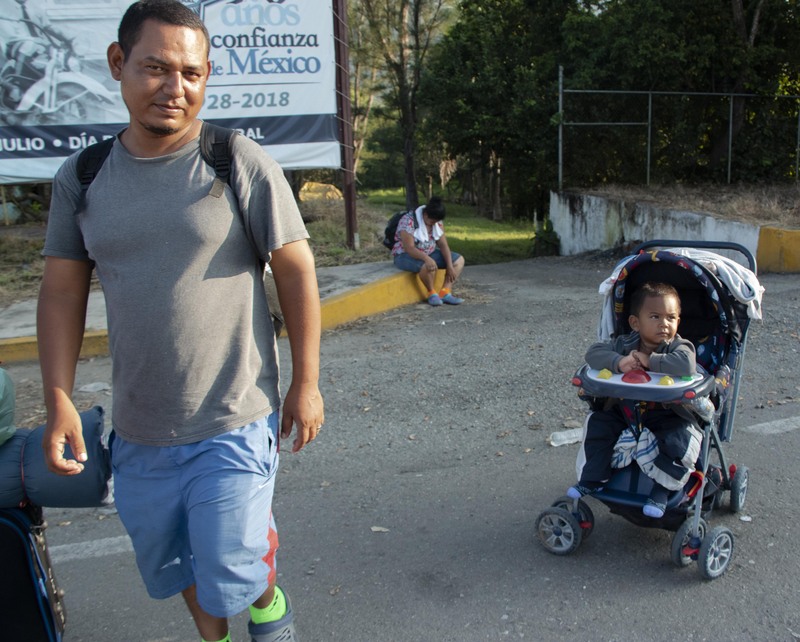 She and her family had woken at 3AM and walked for hours from Pijijiapan to a customs center on the highway where they were looking for a ride. She spoke about how the education system in Honduras has changed over the last decade. Yani: We’re a little tired from the walking we’re doing, and the sun is really getting to us. But we’re blessed because the people are treating us well, they’re giving us food, clothing and they’re treating us well. That’s important. That encourages us to keep moving toward our goal. Our goal is to reach the US. All together and see what the President says, if he opens the doors to us, helps us. Because we’ve left our country not because we want to but because the circumstances compel us to leave. First, there are many factors, but first because of the mismanagement of the president of Honduras [Juan Orlando Hernandez]. For the mismanagement, because that’s the root of why we’re so bad off in so many ways. For example, the canasta básica [a price index of the food that provides basic nutrition] is very high. We can’t even afford eat. In terms of education, it’s not free anymore. It’s been privatized. In terms of health, we don’t have medicine in the health centers. They just give you a prescription and you have to go buy it. And we see that that’s not possible for us because we’re people without a lot of money. There only the people with a lot of money can survive. We the poor, no. That’s why we left. Looking to make things better for our kids. I’m certified in primary education. My area has always been education, but I haven’t been able to work much in it because education has been politicized. They practically only give positions to their people according to political party. So I’ve never had that advantage that someone gives me a position in the education system. I’ve worked in private schools but they pay very poorly. They take advantage of the fact that people don’t have a job. So they pay very low in the private schools. I worked in one that had a position for six hours a week, and they paid L30 [$1.25] per hour. In others, they pay 60, 54 per hour. Effectively, they paid us half. Yes. When Mel Zalaya was president, he was good because we the poor received a credit for electricity. Now today, we can’t pay it because we the poor are the worst off. It’s too expensive for us. And often it’s not what we actually use. They overcharge us. But when Mel Zelaya was president he gave this credit and the canasta básica wasn’t as bad like it is now. Now, this current president, no one likes him, because he exploits the poor. If he stays there managing things, he’s going to be the only one left in Honduras. They don’t invest [in education] like they did before. Because they gave school supplies to the kids, backpacks, they got a credit according to what grade they were in. It’s not like before; they don’t give that credit anymore.